Great. Updating it now actually. Thanks! If you would like to see this game in Taw please fill the future games form. We also have a channel created for this game below the Vanguard PIA office. 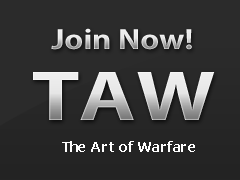 Come join our channel and meet up with other Taw members. I've been considering this game for a while, anyone who has played it, feedback? How's the gameplay, stability? I've played this over the course of the Beta and pretty much have an opinion on it not prior to it's release. This is JUST what I've found from the Beta so far, if they add more to the game, then it'll totally negate what I've said below. The game is very well finished, it has a Team Fortress 2 feel to it. Playing with friends is great and a must for this game, chosing 2 different sizes of ships and being able to customise your equipment, clothes, weapons and ships adds a nice feel to personalise your game. Finding treasure and beating other players to it, especially fortress strongholds are what drives the PvP element. But sadly, that's where it ends. For a $60 game, you'll be getting something that purely promotes progression to take higher leveled voyages (harder tasks but better pay) with the ONLY real reason from what I experienced was to buy new skins for things you already own. You start the game with all weapons (pistol, shotgun, sniper). Unless the game adds a large variety of extra content, such as new weapons to purchase, better cannons, upgrades etc, this game will lose playerbase fast in my opinion. Unless you're the type to love to skin stuff to look like you're rich, you wont find much more reason to play this game. I really hope I'm wrong, but I wont be paying $60 for this game until I see some youtube videos and reviews, or it goes on sale for a really good price. Top and tail of it is, you sail around to find treasure chests on little islands with 2-4 NPC's guarding it and sail away to turn it in, the gold you get, you buy skins with. That's what I gathered from this game so far. The game is pretty fun, especially with friends, and probably a must a times. Right now, the developers are showcasing some of the things you can buy in game in terms of customization, but when it comes to upgrading your actual equipment, that won't be available. They want everyone to be on the same footing, and the tipping point to be player skill, rather than ship/guns. Perhaps in the future that would change, but for launch, that is the case. The ship and player customization is pretty good and should drive players for a while, especially on the bigger crew ships. Right now, We have only seen two traders, and are missing to see the last, The order of souls, who give you tasks on attacking forts and such, which are actually visible to the entire server, meaning PvP intensifies there. I played through the higher level missions of the Gold Hoarders, and it starts to get fun, especially when you have to do specific tasks to reveal the map or riddle. Same is said for the higher level Merchant alliance missions. Bear in mind, the current world, while may look filled, is actually void of most things that will populate it in the full game. On top of that, you will have encounters with the Kraken, which will be similar to the storms you come across in game. Defeating it will be rewarding, according to the developers. There will also be an infamy level, upon which reaching, you will have access to an entire new area dedicated to pirate legends. All this will drive player-base and progression, on top of what the developers add as well. All in all, the game is solid and pretty much worth the $60. My only reason for not buying it is having it on the Windows 10 Store, which isn't bad by all means, but with the issues it presented during the entire testing phase, makes me turn away. The way that combat works, the only weapon upgrades you could feasibly do would be to do more damage per shot which, given the style of game, would just cheapen combat. As Alas stated, the plan that Rare has is to give us a sandbox in which to create our own stories, by and large. If you are the type of player who absolutely must fill out a progression tree as fast as you can, then no, Sea of Thieves will not be for you. If you're the kind of player who likes to have epic combat, and stories that you'll chat about for years to come, then consider Sea of Thieves. The Skeleton Forts, at the moment, are taking around an hour to complete. Are they enormously difficult in themselves? No, they're skeletons with larger health pools and a boss. It's the fact that you have to keep an eye on the horizon to spot other players, resulting in a mad dash for your ship to engage in ship to ship combat that keeps it fresh and exciting. So for those in the GMT timezone, this goes live in an hour! Hm, does anyone know how I can change my name in-game? I got the game linked to my personal Microsoft account (bought the game while logged in with my private email, lol), didn't realise to change it to my alt email in time. So when I got in-game, I saw that my private acct name on the top right instead of my gaming name.